Nearly 61,000 men, women, and children lay their heads down each night in New York City shelters. While this is 2,000 fewer people than the peak in November 2016, the scope of the current homelessness crisis cannot be overstated. More people are homeless in New York City now than the entire populations of Niagara Falls, Troy, or Binghamton. The underlying cause of mass homelessness continues to be the severe lack of affordable housing and the fallout from the “Lost Decade” between 2005 and 2014, when virtually no Federally funded long-term rent supplements were provided to homeless households. During this period, the number of men, women, and children sleeping each night in shelters increased by nearly 70 percent. The Lost Decade fueled an unprecedented spike in the number of families repeatedly experiencing homelessness due to a lack of stable housing. In this nine-year span, an average of 3,500 fewer homeless families per year were placed into permanent housing using Federal resources – leaving thousands of men, women, and children to languish in shelters without any housing assistance, and with many eventually returning to shelters from less-than-stable arrangements. Rent supplements are one part of a much-needed broader plan to meaningfully reduce homelessness in New York City, along with increased capital investment in new housing for homeless and extremely low-income households. They are not the sole solution, given the limited capacity of the housing market to absorb subsidies, but they nevertheless play a critical role. This brief examines the history of rent supplements provided to homeless individuals and families. It highlights both effective and ineffective models of providing rent supplements and offers recommendations to improve upon and bring to scale the solutions proven to offer housing stability for homeless families and individuals. Providing all homeless individuals and families with housing application and housing search assistance. Increase the amount of the Rent Subsidy for Foster Care Prevention, Reunification, and Independent Living to at least $600 per month. 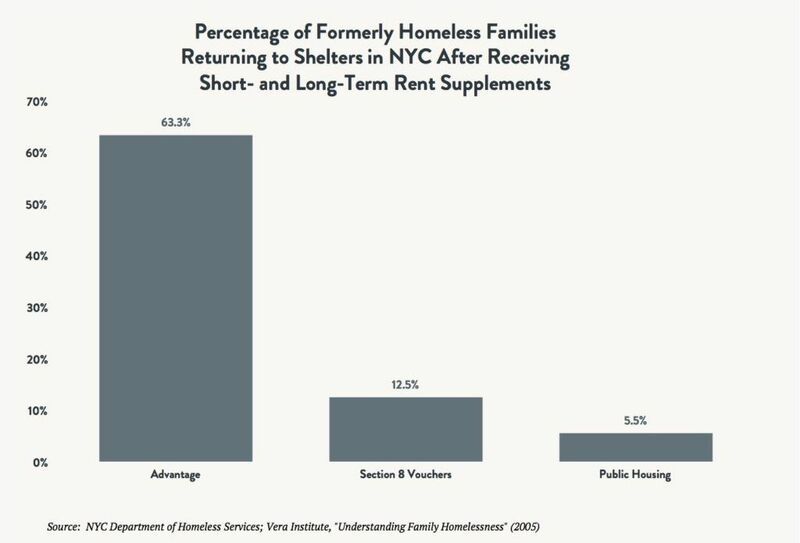 From the emergence of modern mass homelessness until 2005, New York City and New York State successfully used available Federally funded rent supplements to help homeless individuals and families move out of shelters into permanent housing. Federal Section 8 vouchers (both tenant- and project-based), along with public housing, served as the principal means to provide permanent, affordable housing to homeless households during this time. Between 1999 and 2005, on average about one-third of all tenant-based Section 8 vouchers were used to help homeless families move out of shelters. Additional project-based Section 8 subsidies used in supportive and affordable housing developments also helped house thousands of homeless adults and families. From 1999 to 2005, the City helped an average of 3,989 homeless families per year move out of shelters and into stable permanent housing using Federal housing resources. Despite the proven success of these programs, in 2005, then-Mayor Michael Bloomberg stopped giving homeless families priority access to Federal housing programs under the erroneous assumption that their availability was drawing families into the shelter system. 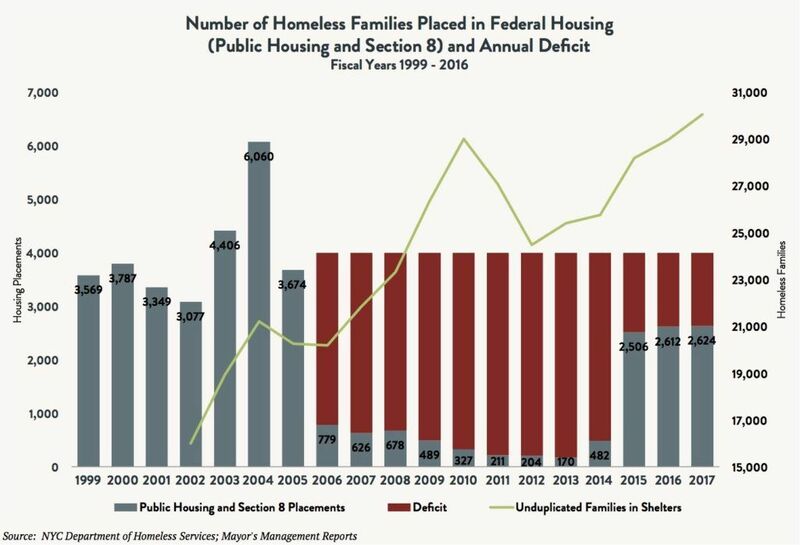 As a result, from 2006 to 2014, the number of homeless families placed into permanent housing using Federal resources dropped to only a few hundred per year – a reduction of more than 3,500 families per year on average. Although Mayor de Blasio changed course and reinstated priority access to Federal resources for homeless families, there currently remains a deficit of 1,400 placements per year, compared with the pre-2005 levels. 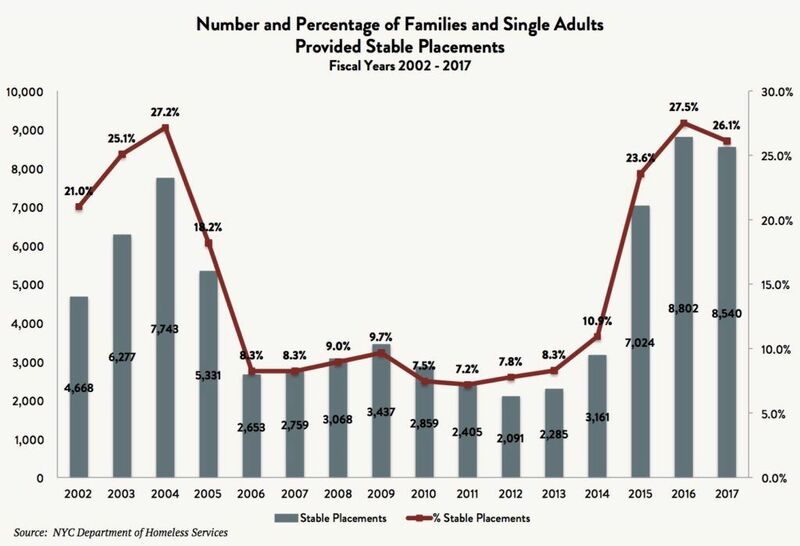 The accumulated deficit is now over 36,000 fewer Federally funded housing placements for homeless families since 2005 – a veritable Lost Decade that has undoubtedly contributed heavily to record homelessness in New York City. After Mayor Bloomberg ended the policy of giving homeless households priority access to Federal housing resources, he launched a series of ill-fated City- and State-funded short-term rent subsidy programs. First was a program called Housing Stability Plus (HSP), which was eliminated after less than three years because of its many flaws – including a 20 percent yearly decrease in the subsidy amount and dangerous conditions found in many of the apartments into which families were placed. HSP was replaced by a new subsidy program called Advantage that offered a maximum of two years of rental assistance. By abruptly cutting off financial assistance for rent after the two-year period – regardless of the stability of the housed family – the program was designed to fail. 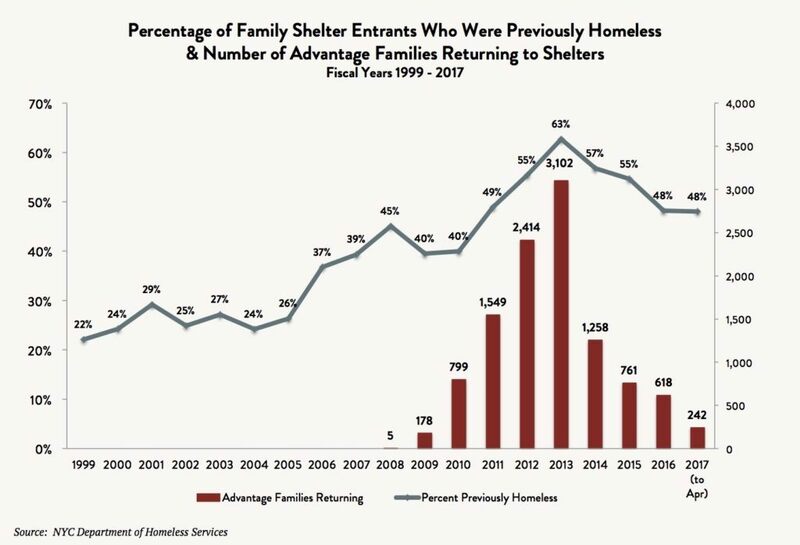 Thousands of homeless families who exited shelters with the Advantage subsidy simply ended up returning to homelessness a year or two later when their subsidies expired. 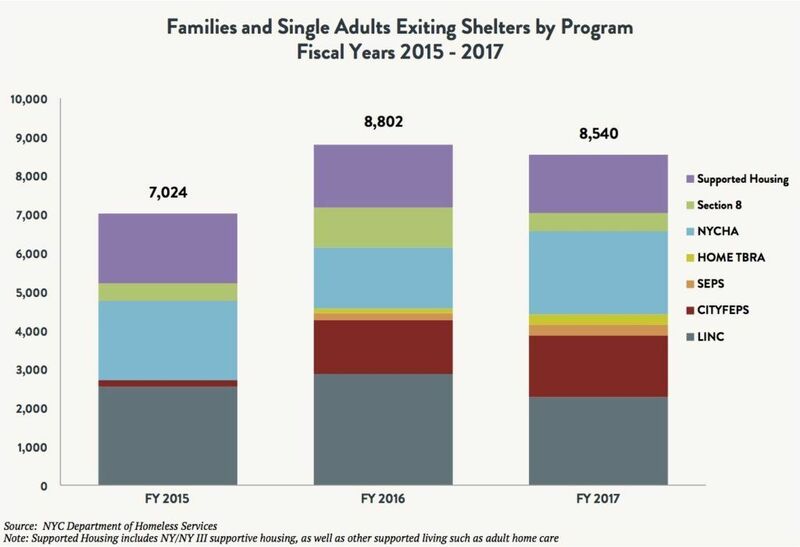 Of the 17,258 families that left shelters with Advantage and did not subsequently transition to a different permanent subsidy, an astonishing 63 percent returned to shelters between 2008 and 2016, with the majority returning between 2011 and 2013. Because of this deeply flawed policy, 10,926 families were forced to experience the trauma of homelessness for a second time. The cumulative impact of these short-term programs was a very predictable failure to help families achieve housing stability. Indeed, they resulted in a massive increase in the number and percentage of families experiencing multiple episodes of homelessness. Prior to 2005, the percentage of homeless families entering shelters who had previously been homeless hovered consistently around 25 percent. With the Bloomberg administration’s reliance on short-term rent supplements, that percentage grew nearly every year, finally reaching a high of 63 percent in 2013. There is no question that the provision of permanent, affordable housing is the best way to address homelessness and keep families stably housed. Research has shown that families who receive permanent rent supplements do in fact achieve housing stability and only rarely fall back into homelessness. The proportion of homeless families returning to shelters after receiving long-term Section 8 vouchers is only 12.5 percent after five years, compared with the aforementioned 63.3 percent for those who received time-limited Advantage subsidies. The effectiveness of long-term subsidies is further evidenced in a study commissioned by the Federal government that examined various approaches for stabilizing homeless families. The Family Options Study analyzed a range of housing, health, and wellbeing outcomes for homeless families who received priority access to permanent subsidies, compared with those that received priority access to short-term subsidies or transitional housing, or no priority access. The results prove unambiguously that permanent, affordable housing vouchers are the best solution to homelessness. The study shows short-term subsidies to be largely ineffective and, unsurprisingly, that reliance on shelter programs alone does not improve housing stability for families. [iii] The challenge for all levels of government is to bring the availability of permanent rent supplements to scale so that all households experiencing or at risk of homelessness can readily receive them. Some City and State rent supplements have also succeeded in helping families stay stably housed by providing rent assistance that is effectively permanent. Three such court-ordered programs stemmed from a 1987 lawsuit, Jiggetts v. Grinker, in which the Court of Appeals held that the shelter allowances provided to families on public assistance were insufficient to meet the actual cost of housing in New York City and forced large numbers of families with children to become homeless. [iv] While the Jiggetts case proceeded, families facing eviction were provided with a court-ordered application system through which rent arrears payments and ongoing rent supplements were approved by the State to help them retain their housing. By February 1997, 27,000 families were in receipt of the rent supplements. After a trial, the court ordered the State to increase shelter allowances in New York City. The State gave New York City and other social services districts the option to add on a rent supplement for families with minor children in receipt of cash assistance who were facing eviction. The City opted to adopt the Family Eviction Prevention Supplement (FEPS) to continue a similar application process for rent supplements as had been developed through the litigation. Between 2005 and 2010, families were transferred to FEPS through the application process. Nearly 10,000 families in New York City presently receive FEPS. The Family Homelessness and Eviction Prevention Supplement (FHEPS) was created in early 2017 after the State quickly settled Tejada v. Roberts, brought in December 2015 to challenge the adequacy of the FEPS supplements. [v] By this time, the value of FEPS had eroded because neither the shelter allowances nor the rent subsidies were indexed to actual housing costs. When fully implemented, FHEPS will increase subsidy amounts to better match market rents, allow families who are not the tenant of record to apply for FHEPS if the tenant of record’s income is less than 200% of the poverty level, and be expanded to include families fleeing their homes as a result of domestic violence without facing an actual eviction. Families currently in receipt of FEPS and two other City programs will have their subsidies changed to FHEPS in one electronic mass re-budget. The new subsidy will increase each year by the same amount as the approved one-year lease increases in rent stabilized housing. Other joint City/State permanent rent assistance programs include SCRIE (Senior Citizen Rent Increase Exemption) and DRIE (Disability Rent Increase Exemption), which freeze rents for seniors and heads of household with a disability and provide owners of regulated housing with tax abatements equal to the tenant’s prospective rent increases. These programs serve over 61,000 households on fixed incomes and undoubtedly help prevent homelessness and housing instability among these vulnerable populations. 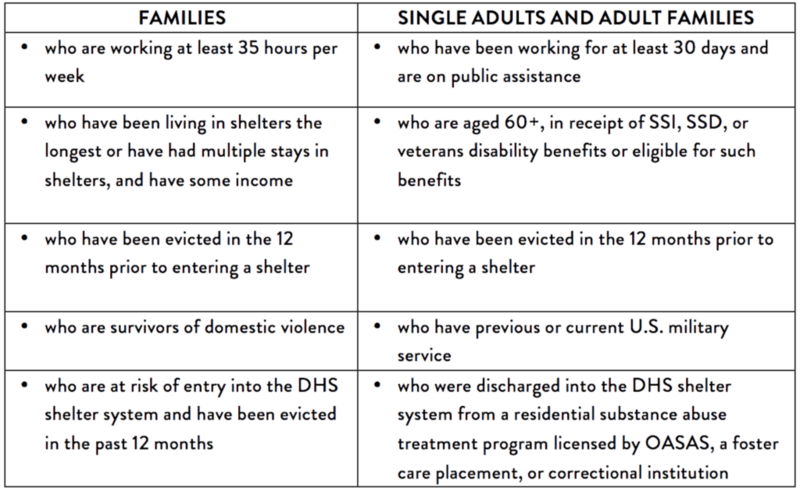 However, DRIE could be improved by including households in which the person with a disability is not the head of the household, such as a dependent child. Mayor de Blasio’s reinstatement of rent supplement programs has made more homeless families and individuals eligible for assistance and helped more of them move out of shelters into permanent housing. In 2014, Mayor de Blasio launched a set of new longer-term rent subsidies for those in shelters or at risk of becoming homeless. Table1 outlines the current rent supplement eligibility criteria. Between July 2014 and June 2017, Mayor de Blasio’s new City-initiated programs helped 11,686 households move from shelters into permanent housing. In FY 2016 and FY 2017, the number of families and individuals moving out of shelters with these rent subsidies has remained at about 4,500 households per year. 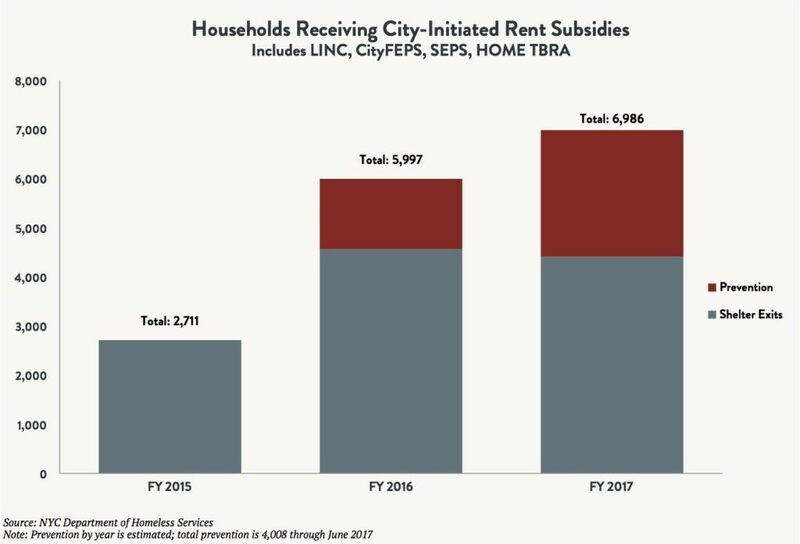 An increasing number of families are also using City subsidies to prevent homelessness: Roughly 1,400 households in FY 2016 and 2,500 households in FY 2017. Another 7,742 households have moved into apartments with the newly reinstated priority access to Federal programs, including Section 8 vouchers and NYCHA public housing, from FY 2015 through FY 2017. Against this backdrop, policymakers and advocates have developed proposals to provide even more robust rent subsidy options. This year, New York State Assemblyman Andrew Hevesi, Chair of the Social Services Committee, introduced legislation to create a statewide rent subsidy called Home Stability Support that would bridge the difference between the woefully inadequate public assistance shelter allowance and actual rents for households facing eviction, homelessness, or loss of housing due to domestic violence or hazardous conditions. Despite bipartisan support and the indisputable fiscal savings that would result from the program, the bill stalled in the State Senate and was not included in this year’s budget. At a time when astronomical housing costs have pushed tens of thousands of New Yorkers into homelessness, the need for large-scale solutions like HSS has never been greater. Another bill introduced in 2015, but not yet enacted into law, would double the foster care rent subsidy – from $300 to $600 per month – provided to prevent foster care placements, help families with a child in foster care reunite, and help youth aging out of foster care live independently. The legislation would also increase the age limit from 21 to 24, to allow young adults more time to access the subsidy and become stably housed. Despite a number of improvements in City and State programs for homeless New Yorkers over the past three years, families with prior histories of homelessness still return to shelters at nearly twice the rate they did in 2005. Over the course of the Lost Decade, an average of 3,500 fewer families each year exited shelters into permanent housing. The effects of this disastrous policy are still being felt as the number of homeless families continues to hover at near-record levels. Mayor de Blasio’s policies of prioritizing homeless households for Federal housing resources and making longer-term rent subsidies available are increasing the odds that homeless New Yorkers will find and remain in permanent housing, but with only 26.1 percent of all exits from shelters considered to be stable placements, it is not enough to make up for the Lost Decade. Providing permanent rent subsidies is one critical piece of a comprehensive approach to reducing homelessness and housing instability. Paired with a significant increase in capital spending on new permanent housing units for homeless households, these recommendations will initiate a meaningful reduction in the number of homeless children and adults in New York City. [ii] There are other State- and City-authorized housing subsidies paired with supportive services used to help homeless people with mental illnesses, HIV/AIDS, and other needs that are outside the scope of this brief.